Well I must admit I didn’t see this coming, Brownells offering up their own line 10/22 receivers. Brownells is producing and selling their model “BRN-22” Ruger 10/22 compatible receivers in 4 options. There’s even a pre-drilled cleaning rod hole at the rear of each Brownells BRN-22™ receiver for easy cleaning of the bore from the chamber, the PROPER way to prevent cleaning rod from damage to the muzzle crown that can compromise accuracy. The BRN-22™ receiver comes in three configurations: the Standard BRN-22 has a factory-style 10/22® top profile, right down to the same drilled-and-tapped scope mounting holes, so it will be compatible with the largest number of aftermarket scope bases and sights. The Railed BRN-22R has an integral Picatinny top rail for extra security and versatility in scope mounting. 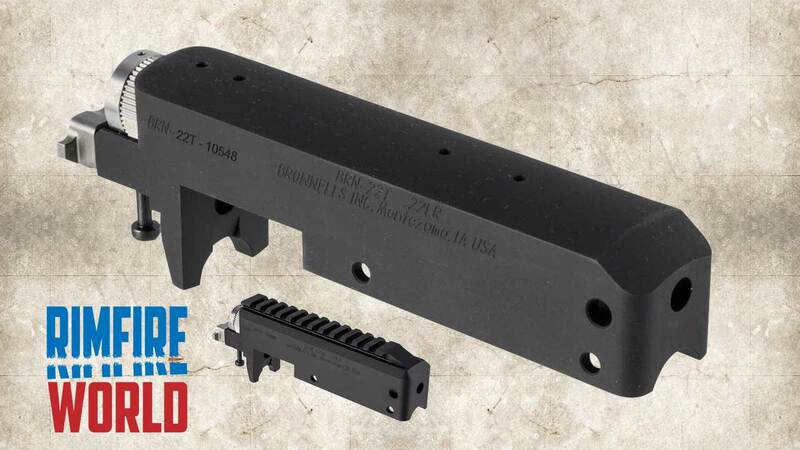 Get a BRN-22™ stripped receiver today and start planning your rimfire rifle Dream Gun™. At these prices, why not get several? The possibilities are endless! Due to varying dimensions in aftermarket and some older factory aluminum trigger housings, fitting may be required.